While some continue to argue the absolute quantitative methodology of measuring brand advocacy (net-promoter figure), word-of-mouth marketing continues to grow at a healthy double-digit rate. "Word-of-Mouth (WoM) Marketing is the fastest-growing segment of the $254 billion marketing services sector of the media industry, which includes among others, branded entertainment, direct marketing and public relations. 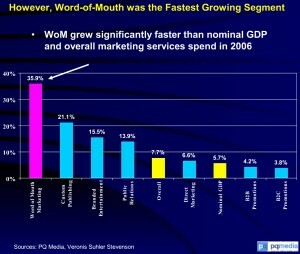 WoM marketing grew almost five times faster than the overall marketing services sector in 2006 and more than six times faster than the overall media industry and nominal GDP. The fundamental challenge traditional media channels and advertisers continue to face is the loss of trust between brand creator and consumer. Moreover, the Internet provides consumers a more transparent, trusted, and efficient marketplace for exchange of information between consumers about the merits of the product or service. Whether you're a b2c or b2b organization, you should leverage social media technologies into your marketing activities and innovation process. For any of your readers interested in more info on Net Promoter, please visit the official site. We have numerous free resources as well as conferences and certification courses for people to learn more. Thanks a lot for the custom essay plus about this post. This is very important to have a knowledge the blog! Well prepared and well presented. Deserves a praise..WoM..
Just today, thought and it's true, if you do not think about it you can not understand the essence and did not get the desired result.